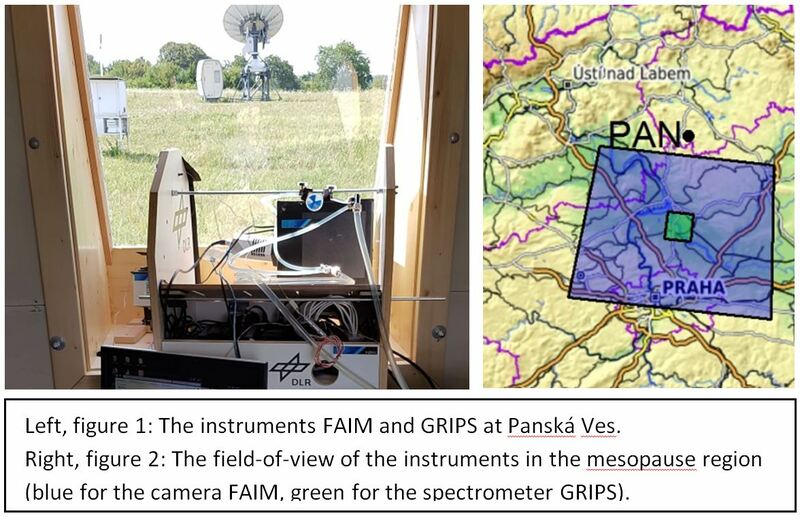 In early August 2018, the German Aerospace Center (DLR-DFD) and the University of Augsburg (UNIA) put two airglow instruments, GRIPS (GRound-based Infrared P-branch Spectrometer) and FAIM (Fast Airglow IMager), into operation at Panská Ves, Czech Republic (figure 1). Panská Ves is mostly famous for its “dishes”, large receiving antennas for satellite data, and for advanced ionospheric observations performed by the Institute of Atmospheric Physics of the Czech Academy of Sciences. The latter are now supplemented by the two instruments GRIPS and FAIM, an advanced infrared spectrometer and a very sensitive infrared camera. Both instruments utilize the hydroxyl airglow layer at ca. 86 km altitude in order to gain insight into atmospheric dynamics. In addition to the observation of gravity waves and infrasound, GRIPS measurements also allow the derivation of mesopause temperature. The measurements at Panská Ves, which have their field of view above Prague (figure 2), perfectly complement those acquired at the Environmental Research Station “Schneefernerhaus”, Germany, at the Sonnblick Observatory, Austria, and at many more locations world-wide, which are part of the Network for the Detection of Mesospheric Change (NDMC).